So far at Torusware we have seen multiple examples of software accelerated by Speedus, such as Redis, ZeroMQ, Docker, etc… Every technology is unique and our current product portfolio, Speedus Extreme Performance and Speedus Lite, is quite successful accelerating applications whenever communications I/O is the main performance bottleneck. Accelerating applications is our passion, and our plans are towards developing a next generation of products, tailored to accelerate specific software, to provide even higher value to our users and clients. Today we are happy to introduce the first of our next generation of products, Speedus-MongoDB, (now in beta release, available upon request at info@torusware.com). Speedus-MongoDB is able to increase significantly the performance of the most popular NoSQL Database, MongoDB, giving a boost to the intraserver communications between the MongoDB server and its clients. Speedus-MongoDB is totally non-intrusive and easy to use (see below instructions, with no changes neither to the code nor the configuration). Now let’s choose a representative testbed. As MongoDB is quite popular in cloud services, Azure has been selected for running the test. Amongst all the instances of Azure, the Standard_DS14 instance has been selected (16 Xeon E5-2660 cores, 112GB RAM, 800GB SSD, Linux 3.16.0-23-generic x86_64 kernel). 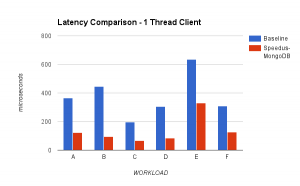 Both tables show that Speedus-MongoDB improves significantly MongoDB performance, up to 3.5X the baseline throughput while showing at the same time lower latencies (up to 78% lower). 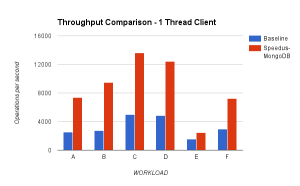 Furthermore, Speedus-MongoDB allows MongoDB to achieve generally more throughput with 4 threads client (even with 1 thread client for Workloads A and F) than MongoDB without Speedus-MongoDB with 16 threads, reducing the infrastructure needs significantly (up to an order or magnitude).